Leaving Savannah is difficult because visitors become enchanted with Georgia’s oldest city. Founded by the British in 1733, everything from the 22 squares, a hallmark of Georgian-era town planning, to the churches and grand old homes oozes charm. The first thing I always do when I get somewhere is walk. Not only do my legs appreciate it after a day of flying (or driving), but there’s really no better way to get your bearings and discover what a destination has to offer than by going for a rambling walk about town. And let me tell you: Savannah is perfect for discovering by foot. It doesn’t matter where you start or which direction you go. Eventually you will pass through downtown, which unlike so many cities, hasn’t been decimated. Housed behind the façades, including some from the late 1950s or early 1960s that were intended to improve the character of main street, are shops belonging to both local and national retailers. One of the most noteworthy is the Paris Market & Brocante. The boutique is also a café with sidewalk seating for people watching over a side order of macaroons and champagne, as there is no shame to drinking before 5 o’clock in Savannah. 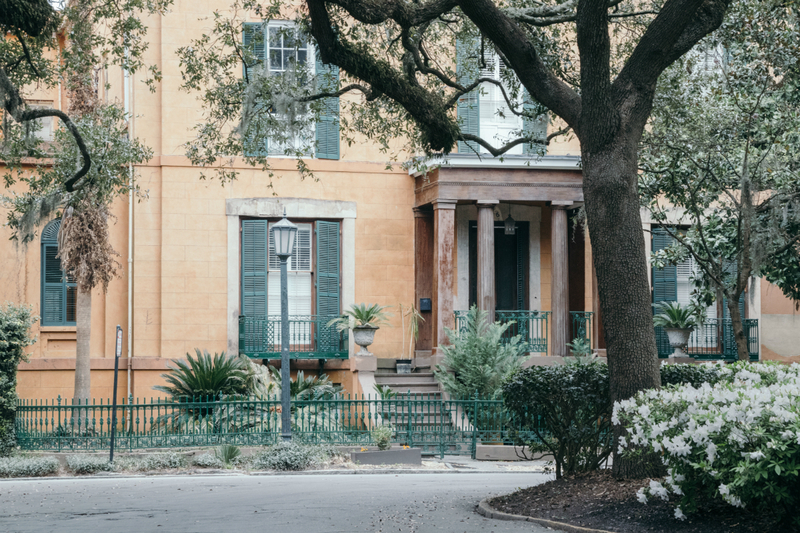 After Broughton Street, the main street in all but name, you begin to encounter what most people associate with Savannah: The squares with picturesque oak trees draped in Spanish moss. As one can imagine, these are popular locations for the Instagram set. Several squares feature monuments, including at Reynolds Square where one finds a statue of Methodism founder John Wesley, who was posted here in 1730s as an Anglican clergyman.